There’s a time known as “shoulder season” in the Rockies, when too little snow means ski season is out and too much snow in the alpine limits options for hikers. But the eager beavers out there don’t need to wait too long to lace up their hiking boots! Spring is the perfect time to warm up your mountain legs on some lower-elevation trails in Banff and Lake Louise. At 1,692 metres high, this little mountain is perfectly positioned for the best views of the Banff townsite and Mt. Rundle. A local favourite, Tunnel Mountain is a moderate hike that climbs via switchbacks to a rounded summit – one of the most scenic lunch spots around. If you’re keen to see some of Banff’s most striking geological features, you should venture down The Hoodoo Trail , a pleasant, forested trail by the Bow River. The trail is 4.6-km one-way, but you’ll be coming back the way you went, so you choose the length! Access: Surprise Corner viewpoint parking lot on Tunnel Mountain Drive. Whether it’s early-season or summer at its best, birdwatchers will want to add the Marsh Loop to their list. This short hike through a natural marshland (don’t worry – you’re mostly walking on boardwalks!) is one of the best places in Banff to watch birds, as well as butterflies and dragonflies. This pleasant trail takes you along the Bow River, past incredible views of the Mt. Edith and the Sawback Range, and to the base of Sundance Canyon. You’ll be sharing the trail with horses and bikes for the first while, but in the quiet of the canyon, you can take some time to explore on your own. You’ll see a 2.5-km trail that loops past the canyon and back to the Sundance Canyon Trail, but it may be too snowy for hiking. This short, meandering trail leads you through beautiful wetlands, old-growth forest and the banks of Echo and Forty-Mile creeks, and is home to resident wildlife, such as elk, deer and a variety of birds. Lengthen your walk by connecting this hike with a saunter along Banff’s Bow River trail or Vermilion Lakes Road. This easy trail switchbacks its way up Sulphur Mountain and offers unparalleled views of the Bow Valley. Once you’re at the top, you can continue along the 1-km interpretive boardwalk to the Cosmic Ray Station and Sanson Peak. If you like, save your knees and take the gondola back down. A walk around Banff’s largest lake is a great way to experience this beautiful corner of Banff National Park. This trail winds its way along the shores of Lake Minnewanka – for over 17 kilometres, in fact – so you can walk as far as you like and come back the same way. And if you would like to take a shuttle from Banff to Lake Minnewanka, ROAM will run buses from the stop outside the Banff Community High School out to Lake Minnewanka. Check out Roam Transit for all schedule and route information. This leisurely path circumnavigates Johnson Lake and provides wonderful views of the surrounding peaks, such as Cascade Mountain and Mt. Rundle. It is a fantastic way to spend part of the day at Johnson Lake, where you can also enjoy one of Banff’s only beaches and boating on the lake. Note: Check for closures with Park Canada prior to going to the lake, as there is fisheries management occurring there throughout 2018. This interpretive walkway follows the edge of Johnston Canyon and leads hikers to the stunning, cascading waters of the Lower and Upper Falls. Keep your eyes out for interpretive panels that provide information along the route, as well as unique rock formations shaped over centuries by the surging water. Access: Johnston Canyon parking lot, Bow Valley Parkway. The beautiful Lake Louise region is at a higher elevation than Banff and it takes longer for the snow to disappear. While hikers need to be careful in this region (there is some avalanche potential on the trails! ), the lakeshore trail is first to open up, and it’s a great place to wander while the snow melts up high. Curious about conditions? 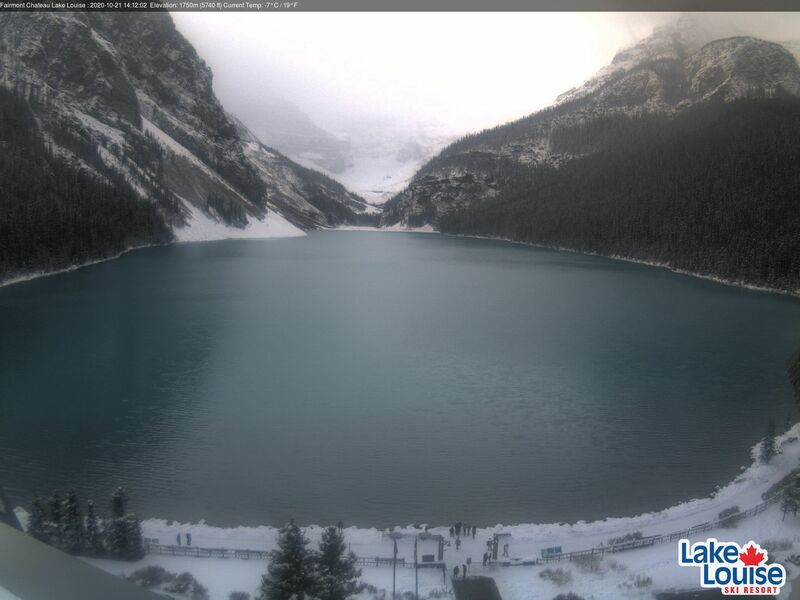 Check the Fairmont Chateau Lake Louise webcam before heading up! 1. Hard-packed snow at low elevations may be slippery, but don’t be deterred! Consider renting some ice cleats/micro-spikes from a local gear store (try Snowtips-Bactrax in Banff and Wilson Mountain Sports in Lake Louise) for a good grip. 2. Prior to heading out, check the Parks Canada website for trail conditions, important bulletins and planned closures that might impact your plans. 3. You might be heading out for a short hike, but as the weather can change at any moment in the mountains, be prepared! Bring extra layers, water/food and bear spray – everything you need to stay happy and safe on the trail.